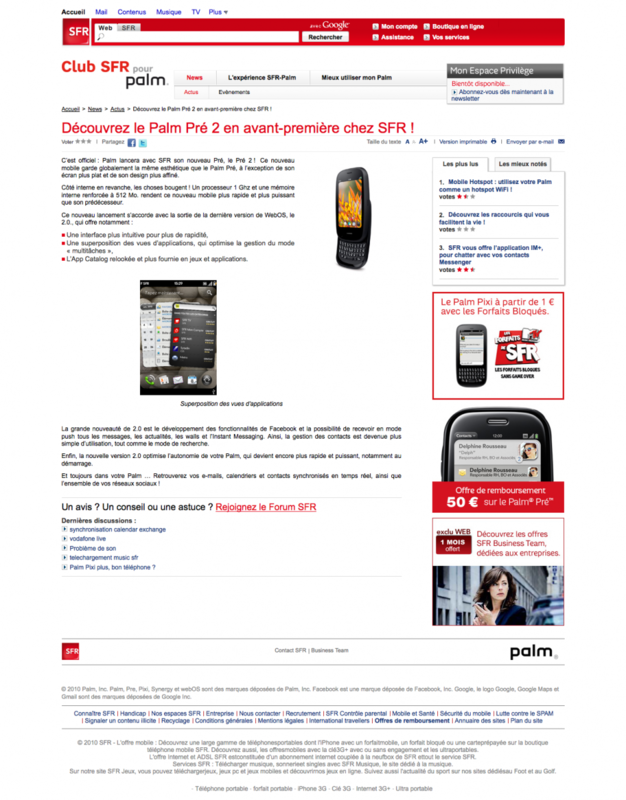 Considering how tight of a lid Palm and HP have been keeping on details about the next Palm device, we were surprised to see it pop up on the website of French carrier SFR (who recently disappeared the Pre Plus). 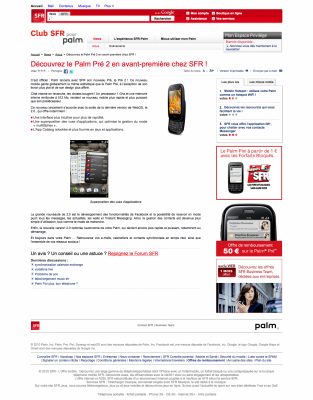 It’s official: the Palm Pre 2 is coming. Update: as arthurthornton notes in the comments - if you look closely that finicky USB door has been removed and replaced with a simple, exposed MicroUSB port. Looking more closely the finish on the edge is matted - so it looks like that crack-prone plastic we've been dealing with is a thing of the past. Update 2: PreCentral member thomas92 notes via email that SFR also says that webOS 2.0 will bring a faster boot time. We really need to work on our French, it seems. 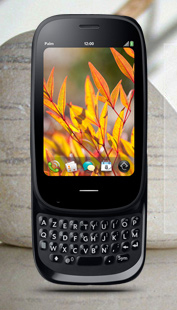 Additionally, our rusty French translation yielded this until-now unannounced webOS 2.0 feature: push. Specifically, SFR is talking about Facebook push integration (touting it as “the great innovation of 2.0”) with messages, events, wall postings, and chat. We’re not going to read too much into that, as we would hope that Palm would integrate push into more than Facebook. So either SFR is overreaching, or they’re not telling us everything about push and instead are focusing on what customers want to hear about, i.e. Facebook. Of course, there are battery life and performance improvements, but if the way SFR is writing it, these might be better than the usual negligible bumps. And if you were wondering what the device codename could be, SFR’s given it away in their unedited image name: Roadrunner. And, before you ask, no mention of price or release date. Source: SFR; Thanks to JMM for the tip! UPDATE: SFR wised up and pulled the page down, but we're the crafty evidence-preserving types. Screenshot after the break!